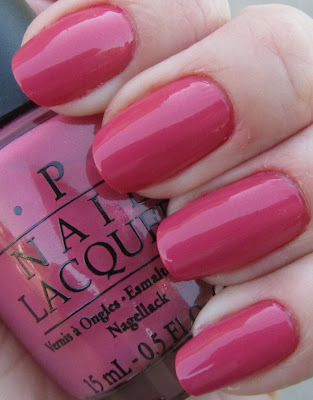 Touring America is OPI's Fall 2011 collection, and includes 8 cremes and 4 shimmers in a wide variety of shades, ranging from bright pinks to vampy purples, pale gray to deep brown. I'm going to break these up into two parts, each with six polishes - today will be the shimmers and two of the dark, vampy shades! All polishes are shown with top coat in natural outdoor lighting. Rose pink with a delicate, subtle shimmer. Very pretty... makes me think a bit more spring or summer than fall though. Still really like it! 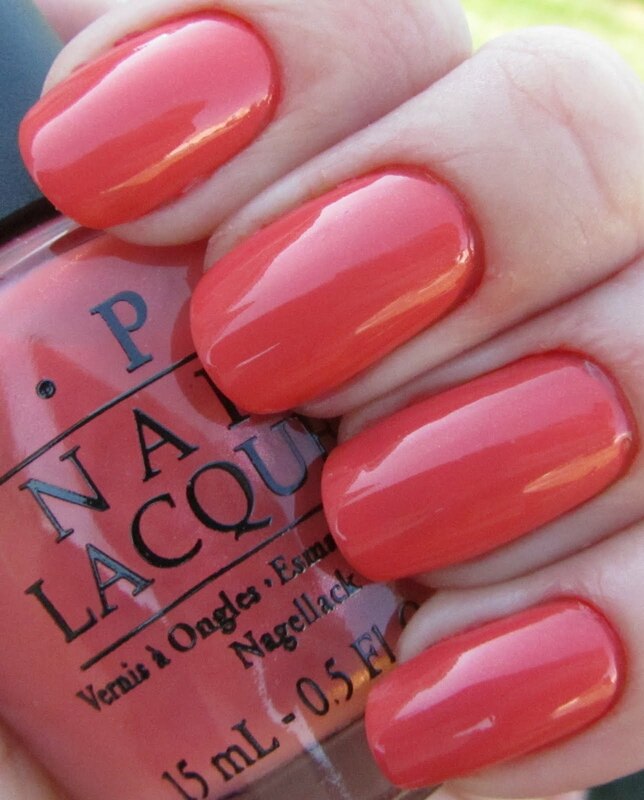 Coral orange shade, with the same subtle shimmer. Also very pretty, maybe a bit more summery. Deep red with subtle shimmer. Pretty red, as reds go - and I am not a huge red fan. This looks more like fall to me! The first of the cremes! 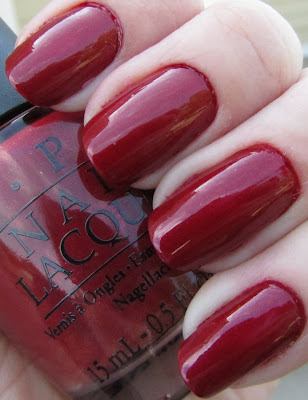 A dark, vampy red-purple creme. Looks to me kind to like grapes? Hard to capture this one accurately in pictures. I though I'd share two pictures of this one, since it was also hard to capture well. 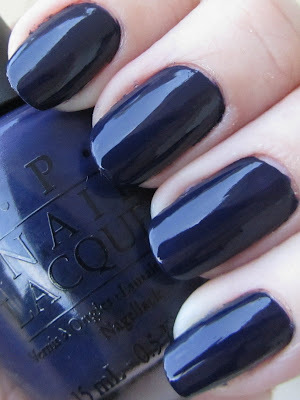 This is a dark navy blue creme with a hint of dustiness to it. I really like the shimmers in this collection - they are very pretty with a subtle, almost duochrome shimmer, even if they don't automatically scream "fall" to me (but I wear all colors at all times, so not a problem). However, the formula on these was a little streaky - after two coats, there were random bald spots and places where the polish had dragged strangely. Three coats evened this out, but a bit of an application issue. The dark cremes applied lovely in three coats, and all six had nice dry times. My favorites here are My Address Is "Hollywood" and I Eat Mainely Lobster, and although nothing is a must-have superstar here, this is a nice (half) collection of colors, with something for everyone. What is your favorite of this half? The color I like the best is Road House Blues. I like a murky, deep, dark blue.